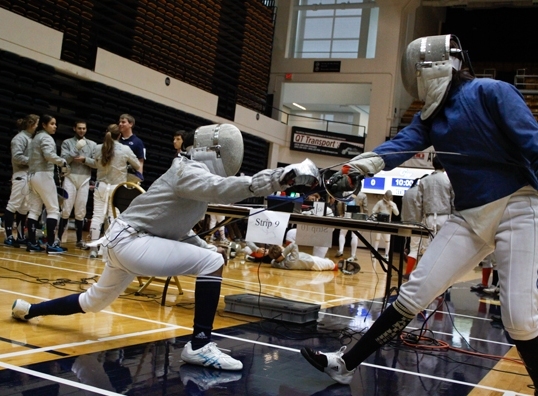 GW Fencing Club is a comprehensive fencing club with competitive and non-competitive members alike. Many new members arrive at GW without any previous fencing experience, to which we loan team gear and provide excellent coaching to get them started. We do social events, as well as eight squad competition events a year. We also have many visiting fencers from foreign countries that enrich the experience of our fencers. Individual competitions are sympathetically supported by the club, but are at the discretion of each individual fencer, along with their personal travel and safety responsibilities. We also have a considerable amount of experienced and intensively competitive members. Full squads in all three weapons are active. The club is members of the BWCFC, and USACFC. USFA membership is not required for joining the team, but is required for most individual tournaments. Practices are held in the Lerner Health and Wellness Center. Practices rotate location depending on which activity the squad is working on including, bouting, PT, and footwork. Competitions include: Southern Intercollegiate Fencing Association Meet, BWCFC South, BWCFC Spring, Chaos, USACFC Nationals. Individuals from the team also compete in: Temple Open, North Atlantic, Cherry Blossom, BWCFC Individuals. Colette Bilynsky: 3rd Place Women's Foil.